Everyone loves the look of wood—and there is more than one way to achieve it. Hardwood floors are one of the hottest trends in home decorating, desirable for its good looks, durability, easy cleanup and so many other benefits. However, the cost of real hardwood doesn’t always fit with a homeowner’s budget. And for homeowners with pets or young children, real hardwood can be difficult to protect and maintain. Fortunately, there is more than one way to achieve a wood look. Laminate, resilient and porcelain tile all have wood-look options that offer many of the benefits of real wood and avoid some of its drawbacks. Here’s a comparison of the products—including the real thing—to help you decide which one is best for you and your home. Easy clean-up—just a quick wipe will take care of most spills. Feeling of quality—hardwoods are high-end furnishings that enhance home spaces. 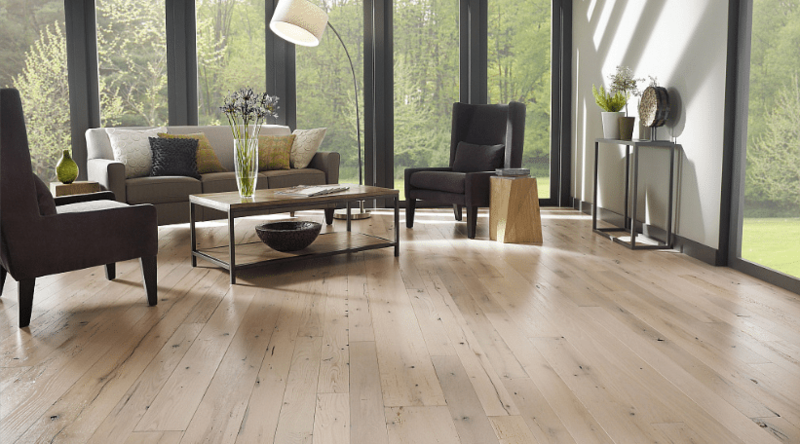 Long-term investment—hardwoods add greatly to the value of a home. Variety—there are so many hardwoods available, from light maple and ash to medium oak and pine to dark cherry and mahogany, not to mention exotic woods such as bamboo and acacia. There also are many textures available, including polished, distressed, scraped and wire-brushed. In this category, you also have the option of installing solid or engineered hardwood. Solid hardwood can be refinished many times over the life of the product. But it also can expand and contract with the humidity in your home. (Note: Skilled contractors take these fluctuations into consideration when installing a solid hardwood floor.) Engineered hardwood, on the other hand, is bonded with adhesives under high temperatures and pressure. The product isn’t as subject to humidity issues but generally can’t be refinished as often as solid hardwood. Lower cost—laminates are cheaper to purchase and install than real wood. Easy installation—the product easily interlocks and can be installed over most floors. Durability—laminates stand up well to foot traffic, spills and moisture and don’t scratch, dent or mar as easily as hardwood. Variety—there are different plank widths, “wood” types and colors available. One drawback of laminates is that they can’t be repaired as easily as real wood. Additionally, not all laminates are created equal when it comes to appearance. The key to achieving a real-wood look is to purchase a top-of-the-line product. Lower cost—like laminate, resilient flooring costs much less than real wood. Easy installation—an interlocking system makes installation a snap!, plus the product can be floated over most substrates. Durability—resilient flooring can withstand all sorts of abuse; higher-end products are colored all the way through so scratches are hard to see. Authentic appearance—even pros sometimes have trouble telling resilient wood flooring from the real thing. Comfort—resilient wood feels cushiony underfoot. Variety—there are many colors and textures available; weathered and grayed “woods” are among the most popular. Durability—porcelain holds up against stains and scratches (but can crack if something heavy is dropped on it). Water resistance—porcelain tiles are perfect for all high-humidity and -moisture areas. Feeling of quality—porcelain is associated with wealth and Old World luxury. Long-term investment—porcelain adds value to the home. Variety—there are different sizes and colors available. Contemporary styling is especially striking in this product category, with wood looks ranging from sleek to industrial to shabby chic. One decision you’ll have to make with porcelain is which grout to use. Check with your installer and/or local paint store to make sure the grout takes into consideration the location, foot traffic and humidity level of the area where you intend to install tile.